In the world of today, we want every video contents like movie and TV show to be available at our fingertips. Not only that, but we also want such files on every electronic device in our arsenal. We have several free DVD rippers, however, WinX DVD Ripper and handbrake stand out. As it stands, there are some cogent reasons why you may want to rip/convert your DVD. Do you know that it is possible to also rip a protected DVD? This can only be possible with the best DRM-Protected DVD ripper. In the course of this article, you will learn how to use WinX DVD Ripper to rip copy-protected DVD for free. Meanwhile, let me summarise why you need to rip/convert your DVD. First off, ripping your DVD will save you some shelves space. Secondly, in order for you not to lose your DVD collections, you may want to rip and convert it by creating a copy of it elsewhere(E.g on your hard drive or USB). Another valid reason is the need to have your videos in various video file formats. For instance, we all know how boring a flight or train ride can be without access to a robust library of entertainment. Consequently, converting your DVD to other video formats would enable you to watch them on various devices. What are the best DVD rippers? What does handbrake lacks that WinX DVD Ripper has? Which is the best DRM-Protected DVD ripper: Winx DVD Ripper Platinum or Handbrake? When it comes to ripping a DVD, two products come to mind. The first one is handbrake and the second is WinX DVD Ripper by Digiarty Software. Handbrake is cheaper and less featured-packed when it comes to ripping a DVD video. With WinX Ripper, you get a whole lot more for the token you pay. Luckily, they are currently running a giveaway which means you can actually, use all the full features for free. Warning: It is of the essence to check the intellectual property laws in your own country before starting to rip DVDs. there are varying levels of permission from different governments regarding the legality of ripping a DVD. Fortunately, and Digiarty Software guide to determining what is legal and what is not when ripping videos. Besides, even if it is legal in your territory, it will only be for personal use, research or possibly educational purposes. Wikipedia defines Ripping as the extracting of all or parts of digital contents from a container. Originally it meant to rip music out of Amiga games. Later the term was used to extract WAV or MP3format files from digital audio CDs, but got applied as well to extract the contents of any media, most notably DVD and Blu-ray discs. Secondly, WinX DVD Ripper can rip all kinds of DVDs including some pretty sophisticated DRM protected DVDs like Disney DVDs without third party apps. Handbrake, on the other hand, can only rip unprotected and non- encrypted DVDs. Thirdly, WinX ripper is capable of fully hardware accelerated speed, in high quality and with a lower end result file size. The same cannot be said of handbrake. Fourthly, handbrake only owns two containers: MKV and MP4 while Winx DVD Ripper can embrace All Types of DVDs. In addition to the above strengths of WinX, WinX DVD Ripper is also able to rip damaged DVDs, special Japanese DVDs, plus region-free 99-title DVDs . This feature is lacking in Handbrake. Also, WinX DVD Ripper doesn’t require extra add-ons to run. By contrast, Handbrake does. Yet WinX is able to offer over 210 file types to output to, where Handbrake only offers MP4, MKV and sometimes M4V. While at it, WinX DVD Ripper put less strain on your computer. In other words, it is more gentle on your computer CPU. 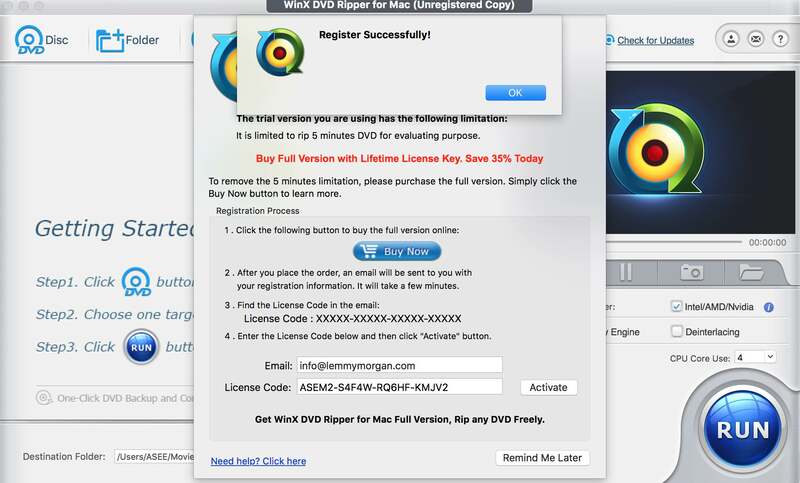 Download and Install the version of WinX DVD Ripper for your particular operating system(i.e Mac or windows). Luckily Digiarty software is running a giveaway for WinX DVD Ripper on their website currently running a giveaway on their homepage. You also need a computer with a DVD drive and the WinX DVD Ripper software. You can download it from the link above. Finally, Make sure your hard drive has enough space to store the DVD video file you want to rip. After installation, Click “Yes” if the UAC window pops up. Select a destination folder and click “Next”. It takes seconds to install WinX DVD Ripper Platinum. Since you have the keys to the full version as a result of their giveaway, click on “Register. Now that you are done with the registration, load the DVD you want to rip into the DVD drive. Then open the WinX DVD Ripper application. This wonderful piece of software can be up and running in three easy steps. Step 2. 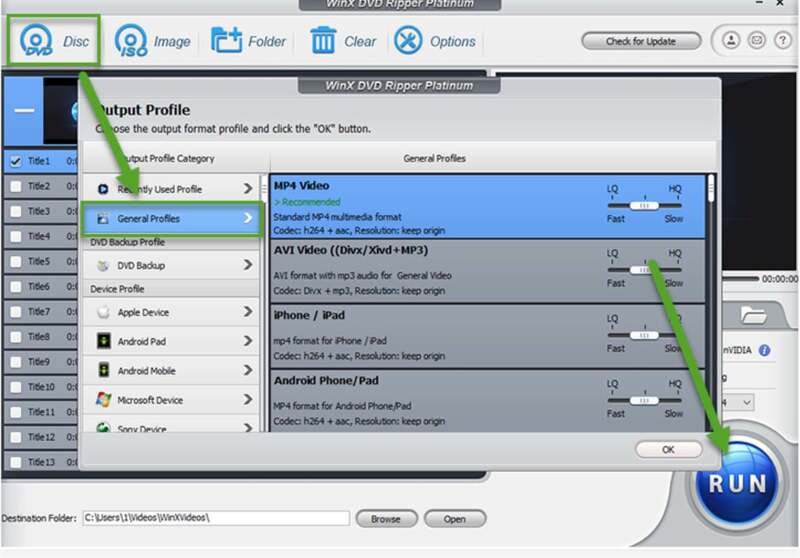 Select an output profile you want to create, like MP4, ISO image, iPhone, iTunes, Huawei, etc. Step 3. Finally, you can now click on the Run icon to start up the ripping process. Note: you can dive deeper for more features in Output Settings, like cropping, codec type, bit rate, aspect ratio and plenty more besides. If you want to run everything at maximum hardware potential for the quickest result, enable CPU Core Use or the Hardware Accelerator box. Then select Use High Quality Engine or Deinterlacing for the highest quality. Further insights about how to rip a DVD with WinX DVD Ripper platinum here. The answer is unanimously in the favour of WinX DVD Ripper Platinum. The only constraint that there was is the fact that WinX is a paid software while handbrake is open source. 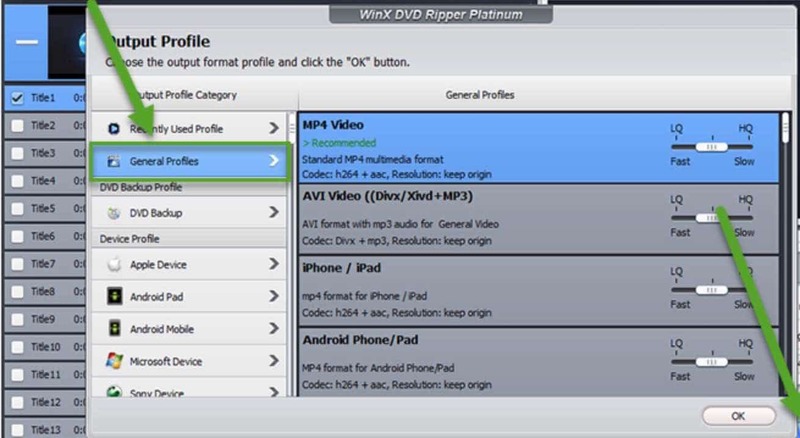 I now bring a piece of good news that as at the time of publishing this article and for many days to come, you can be an owner of the full license of WinX DVD Ripper Platinum for free. You would ask me, how is this possible?. All you have to do is to participate in their ongoing giveaway events by following this link. Going over which is better in ripping a DVD will amount to repetition. Let me just summarise the uniques advantages of WinX over handbrake. If you even want to rip or digitize a DVD that is copyright-protected, WinX DVD Ripper is the way to go. Also, if your concern is which supports more containers or which consumes fewer PC resources or which of the two supports hardware acceleration, think no further, get the license now and see what you have been missing. Finally, WinX DVD Ripper supports more video formats as well as DVD containers than handbrake. Need more information? Go to WinXDVD homepage.